Below is a sample screenshot of the tool with a few annotations added. 3 Steps to Moon (or sun) catching. The red graph implies that the target may not be visible. In this case it’s likely because the slope of the mountain prevents the observer from seeing the base of the Lick Observatory. The tool is designed to make it easy to catch the sun or moon over a landmark of your choice. It does all of the calculations required to determine the distance, altitude and azimuth required to get the sun or moon over your favorite landmark, and with a single button will calculate the dates over the next four years when the desired alignment can be achieved. You will need to have GPS coordinates for the place you plan to put the camera (called the Camera Location or Vantage Point), and the landmark you intend to photograph (the Target). See below for some tips on getting GPS coordinates. Paste your two GPS locations into the boxes. For how to get GPS locations, see later hints. Adjust the Camera Height box to compensate for how far above the ground the camera will be placed. Default is 3 feet and usually doesn’t matter much. However if you’ll be standing on the deck of the Golden Gate Bridge, you’ll need to enter the approximate height above the bay. The Elevation boxes (grayed out) are determined automatically when you stop moving the Camera or Target indicators. If you KNOW the elevation is wrong, you can fix it up by adjusting the height. If your target is a man-made structure, you should find out how tall it is. It’s remarkable how accurate a Google search can be. 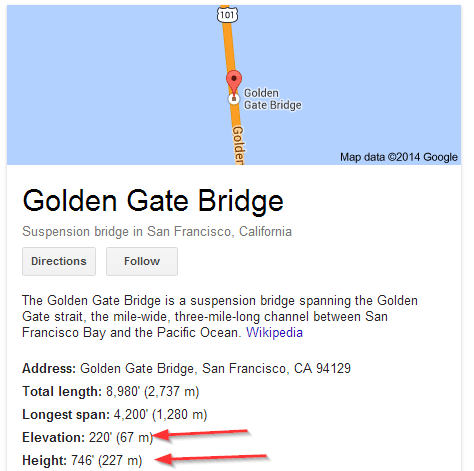 Try: “How tall is the Golden Gate Bridge” (see below for the data the search returned). All measurements are in FEET. With apologies to most of the world who use the metric system. Notice how the small window in the upper right is zoomed in. It shows the size of the moon overlaid on the ground. You can often see right away whether the moon diameter is larger than the object on the ground. Moving the camera farther away increases the apparent size of the moon. Moving closer decreases the size. You can fine tune the marker in the zoomed view by dragging it around. As you move any of the markers, MoonChase keeps track of the distance, angles and more, but it will only be completely accurate when you let go. 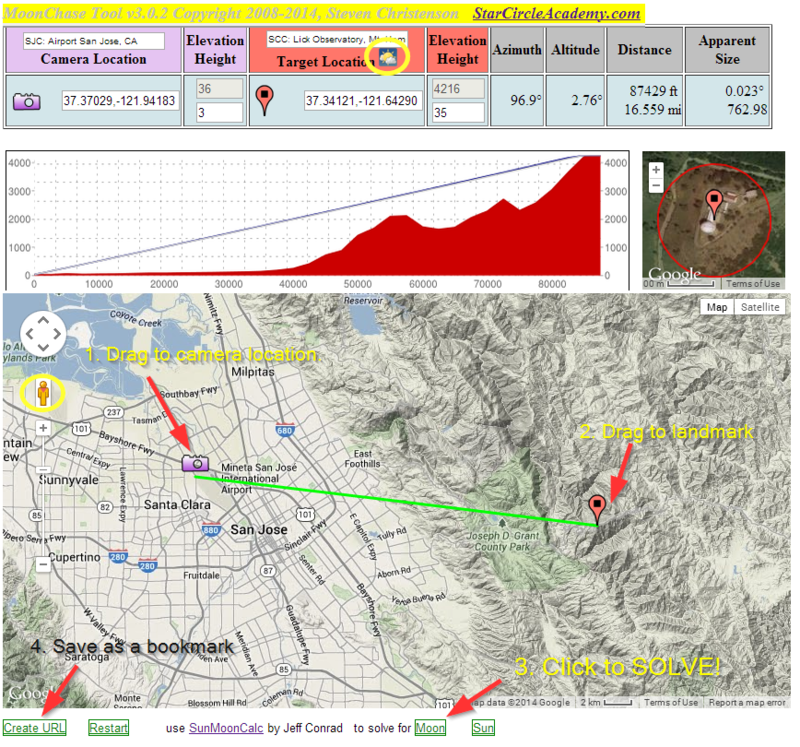 The Moonchase tool does not request the elevation of the marker location until you drop it. Solving for the Moon or the Sun is dead simple. But there are some slightly prickly usability issues to consider. Clicking either solve button feeds the calculated date to the SunMoonCalc program and requests that SunMoonCalc display the results. But SMC will create two windows to do that, one of which may be stopped by a pop-up blocker if you’re using one. If you’ve already solved once, the second solution will display in the same window as the prior solution even though a second copy of SunMoonCalc may open. The solution created seeks for a moonrise or moon set that differs from sunrise/sunset by a maximum of 100 minutes. That’s a pretty wide range of times and not every time may work well for foreground and lunar exposures. Generally only FULL moons can ever meet those criteria. The time of interest for a moonrise or set is marked in the column for Moonrise or MoonSet with an asterisk. The Time MIGHT be inaccurate due to daylight savings time. As noted earlier, accuracy is higher if the description for the location contains a single comma and a state abbreviation. The solution that MoonChase asks SunMoonCalc to generate is within half of a degree in azimuth in either direction and half a degree difference in altitude in either direction. If you will be shooting in an area that has more freedom to move around, the Rise and Set Criteria SunMoonCalc can be changed. Please note that if the matching azimuth and elevation are both at the maximum or minimum tolerance the moon will miss by at least one full moon diameter. The solution created is for the CENTER of the moon. If you want the sun or moon to be entirely above the target, add half of the “apparent size” to the target height. To make the moon be exactly behind the top of the target, subtract half the apparent size shown. (If it’s popular enough we may add a check box to make these adjustments automatically). The default range for solutions is 4 years from the current date. Because the full lunar cycle is 17 years, it’s possible that a problem on the very edge possibilities may not occur again in another 17 years! The graph that is displayed tries to take its best guess if there is an obstruction between you and the top of the target and draws in red if it seems there might be. But remember that the data doesn’t include trees, buildings or even highly accurate geographical measurements. Some areas in the world will be far less accurate – or there may be no elevation data at all. When the day of the alignment draws near, you can click the little weather icon to get a great graphical view of the weather. We’ve talked a lot about weather tools. We highly recommend Stephen Trainor’s Photographer’s Ephemeris, unfortunately the one thing the desktop version of TPE does not do is allow you to adjust the desired altitude to accommodate objects of specifiable height. You may find it simpler to let MoonChase calculate the proper altitude even if you use TPE to hone in on a solution. One way, you could use the MoonChase tool, for example is to calculate how close you should get to a tower so that an eclipsed moon will appear over it, or to solve where to stand so that the radiant point of a meteor shower will appear above a landmark (for the latter, you will need to use a tool like Stellarium to inform you of the altitude and azimuth of the radiant point). Another use for the MoonChase tool is to calculate angular size. Say you want to photograph El Capitan in Yosemite and you know the angular field of view of your lens is 40 x 30 degrees. You can place the target marker on top of El Capitan by using the map in Terrain mode. Then drag the camera marker away from or toward El Capitan until the calculated altitude is less than 30 degrees. Now you know where to stand El Capitan to be able to get it the height of the monolith all in one shot. You’ll also know exactly which direction you must face. The sight line graph can can also come in handy. It can reveal if there are features like hills in your way that may block the view of the lower portion of El Capitan. But do remember that trees, boulders and buildings are NOT reflected in the elevation data. The Moonchase tool has an “Issues” section. Click it to see the known issues. While we worked hard to make accurate calculations, we cannot guarantee that your results will be perfectly accurate. Accuracy diminishes as distance between the target and the camera location increases. After about 15 miles earth curvature starts to matter significantly. We hope you enjoy the tool. If you have questions or requests for enhancements, feel free to leave a comment here. Click the Camera Icon (in the header) to scroll the map to the camera marker. This is MUCH more convenient than zooming in and out which many tools make you do! Click the Target Icon to scroll the map to the target location. Drag the yellow guy (Pegman) onto the map to get Google’s “Street View”. We suggest dropping the yellow guy on the Camera location. Click the close button in the upper right of the map to return to regular map view.